I have now started to get an idea of how I want to decorate the small apartment we just bought in Barcelona Decorating small spaces on a small budget, as you know, leaves the hardest thing to do . Fortunately, the building materials and construction very cheaper in Spain than in Sweden . But it is also very difficult to find someone you can completely rely on doing a good job . We Scandinavians are generally also very careful about how it should finally  look like. A challenge! The picture below shows Ilse Crawford's studio in central London , which is currently for sale. 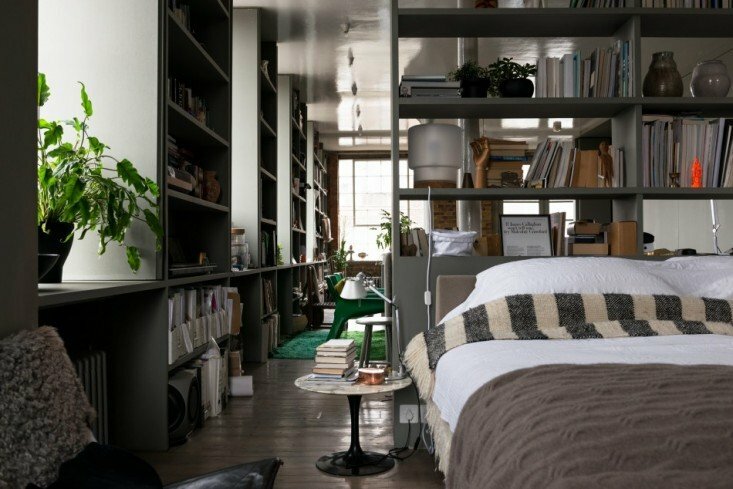 Smart solution but "not so practical" with a bookcase instead of the wall, as a room divider !